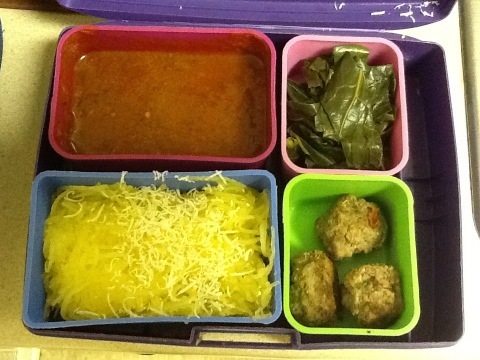 Spaghetti and meatballs is a common weekday meal for us. There are plenty of good jarred pasta sauces available now that are made without any added sugar, and my family likes frozen meatballs just fine. Pasta makes me tired and fat (or at least bloated), but spaghetti squash is a great lower calorie and lower carb alternative. This time I tried a new method. I poked holes in the squash with a fork, then baked it whole for an hour. I didn’t feel that the squash was soft or moist enough at that point, so I sliced it in half (much easier than when raw), scooped out the seeds (harder than when raw) and baked it cut side down in a casserole dish with an inch of water in it for 10 or 15 minutes. The Italian Sausage Meatballs were easy but time-consuming to make. I used 90% lean grass-fed ground beef and mild Italian sausage from Earth Fare for the meat. I did not add the cream or the Parmesan. Instead of chopped onion I used onion powder, since the rest of the family is opposed to crunchy onions. Next time I will also sub garlic powder for the minced garlic since Dora complained about “the little weird-textured white things.” I fried the meatballs in leftover bacon grease in my large cast-iron skillet. Tom, Jewel and I thought the meatballs were fantastic. This meal took more orchestration than I expected, and Tom’s help was invaluable. I apologize for the lack of pictures; I just plain forgot! Leftovers for lunch in my cute laptop lunch box. 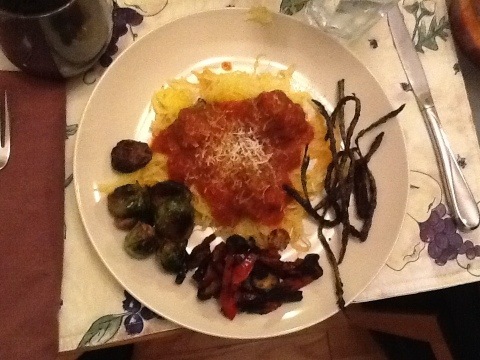 We had spaghetti squash last night! When I have time, I bake it, halved, with water. I’ll try baking it whole next time. When I’m tight on time, as I was last night, I poke holes in the squash (deep, with a knife) and microwave it for 10-12 minutes, depending on the size of the squash. I found out the hard way, of course, that I have yet to earn my “asbestos hands” stripes! I’ll have to try baking it in the microwave as well. That would be a good option during the week – it would take the same amount of time as pasta then.